The first meeting of the HACAN East Parliamentary Group was held in November in the House of Commons. It was chaired by John Cryer MP (centre). Amongst the attendees were Jon Cruddas MP, Redbridge councillor Sheila Baines, HACAN East chair John Stewart, and Clyde Loakes, deputy leader of Waltham Forest. 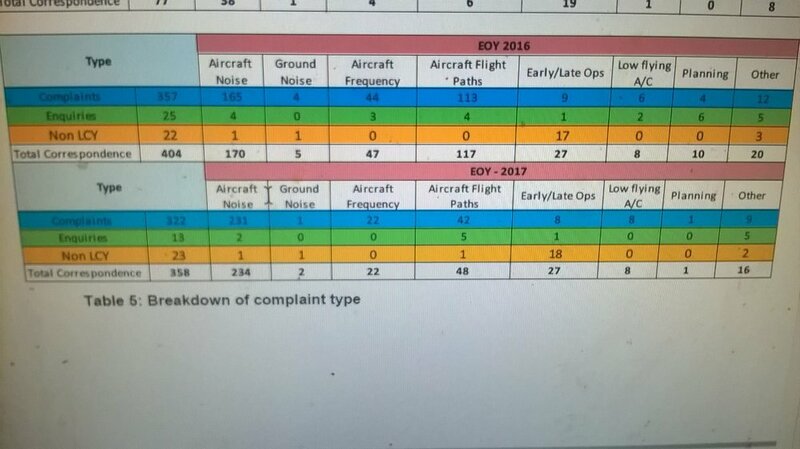 In a survey over 50% of Waltham Forest residents "strongly agree" that they are disturbed by aircraft noise in their homes. People living under a flight path of London City Airport say they are “enraged” that they were not consulted about the increase in air traffic. The airport were given the paths in February meaning more planes will fly in a narrower space, which people say is impacting their sleep and quality of life. Michael Plant, who lives in Leytonstone, said the problem has got so bad that he is sleep deprived and almost crashed his car one day. The 45-year-old said: “It is just a complete nightmare. I might as well be sitting in the middle of a runway. “For eight months I was having between three and five hours sleep a night and I started to get migraines. “I ended up nearly crashing the car on the way to Sussex one day and I had to turn around and go back home. Mother-of-two Saci Lloyd, who lives in Leytonstone, said she is angry that the airport didn’t consult residents and she feels there is no need for all the flights. The author said: “I feel enraged that they can do this without a public consultation. “Many of the planes are not full and they are carrying businessmen to Amsterdam and Geneva who could make a call instead. Steve Cushion, of Fladgate Road, Leytonstone, has lived in the area for 35 years. The 66-year-old said: “I think it is disgusting and I see no reason for building an airport in central London just so a few business men can save half an hour to get in and out. “I would like it to close but I realise it is really unlikely. Chair of Forest Residents’ Association, Vaseem Gill - www.vaseemgill.com - who has lived in Leytonstone for 30 years, said: “When my family sits out in our garden and a plane passes we cannot hear ourselves talk. A spokesman for London City Airport said: “From February this year, the airport was required to replicate its existing flight paths to enable a new form of aircraft navigation, as part of a wider programme to modernise airspace over south east England. “In practice, this means aircraft fly the same routes as previously, but more accurately. “A new system for arrivals was also introduced, positioning aircraft over the Thames Estuary to reduce time flying over residential areas. The concern about the concentrated flight paths became very clear indeed when we took a stall at the Wanstead Festival on 18th September. People were queuing at the stall to tell us how the flight paths where badly affecting them. Our chair John Stewart, a veteran of numerous stalls over many years said he had never seen so many people come so eagerly to a stall to talk about their experiences. HACAN East was delighted to speak at the Annual General Meeting of FORA, the residents' association which represents many of the Leytonstone residents right under the new concentrated flight paths. We heard about the real impact the flight paths are having on people's lives but were able to give them some hope in that the Civil Aviation Authority, which is required to review the changes by February next year, has agreed to meet with HACAN East. London City Airport has released the findings of a poll which showed that “77% of East London business decision-makers are in favour of London City Airport’s expansion plans.” Comres, on behalf of City Airport, polled “business decision-makers” in Canary Wharf, Westminster, Soho and the City. ComRes surveyed 1,002 business decision-makers in Central London business districts by telephone between 11th February and 2nd March 2016. Respondents were based from Canary Wharf in the East, through the City of London and Bank, to Westminster and Soho in the West of the capital: http://www.comres.co.uk/polls/london-city-airport-business-survey/. But HACAN East campaigners have dismissed the poll as 'dodgy'. They say it stretches the definition of East London beyond belief. It places Soho in East London and suggest that London City’s new PR team need to brush up on their geography pretty quickly. Soho is East London?! 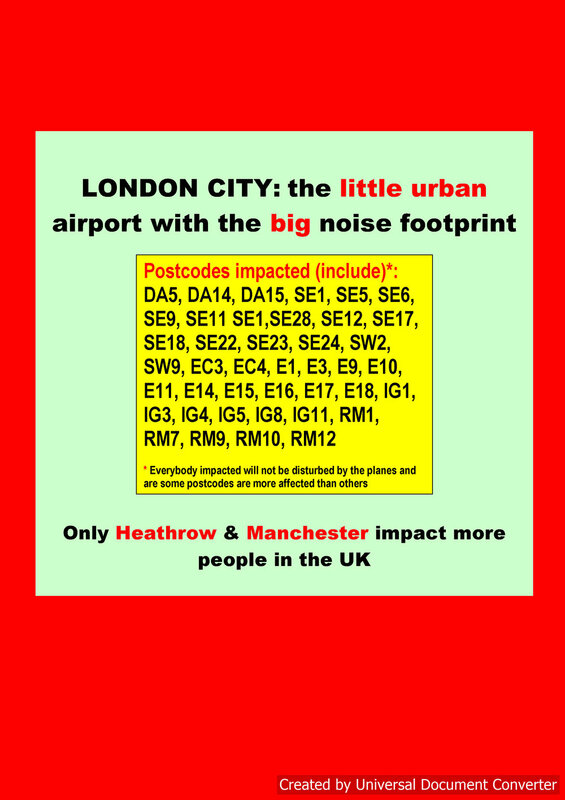 Local residents group HACAN East dismissed a new “community pledge” for the London borough of Waltham Forest as both “desperate and irrelevant.” The plan, launched by London City Airport on Thursday 21st April , highlights a “five-point community pledge” for residents of Waltham Forest. Nearly 27,000 Waltham Forest households will receive leaflets over the next week, with a further 136,000 pledges distributed across other East London boroughs. HACAN East that the plan was high on nice-sounding rhetoric but low on specifics. It also pointed out that this is the same airport which refused to leaflet local residents to ask or inform them about concentrated flight paths but now can deliver over 100,000 PR leaflets. The Planning Inquiry into expansion of City Airport ends today [5 April]. The Inquiry, which has been sitting at City Hall since 15 March, is a result of City Airport's appealing of the Mayor of London's decision to overturn Newham Council's decision to allow the expansion of City Airport. HACAN East are attending as a Rule 6 Party. On the final day of the Inquiry, all parties gave closing statements, which will inform the Planning Inspector's final conclusion as to whether the airport should be allowed to expand. A decision is expected in the summer. HACAN East's closing statement can be viewed here. A more detailed update, and a blog post will follow in coming days.